Civinfo > 9th Generation Euro Honda Civic (2012 - 2016) > This is How To ... (Guides Only) (9G) > How to remove the radio? 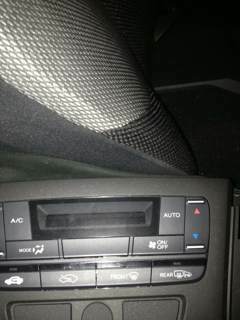 How to remove the radio? IMPORTANT: Ensure the vehicle is safely parked in a well lit location. Disconnect the car battery. Make a note of the radio security code as this may be required after the power is restored. Proceed carefully and AT YOUR OWN RISK. DO NOT attempt if you have limited time or your are not confident in DIY procedures. Note that there may be wiring harnesses / plugs for the SRS AIRBAG system in the vicinity (Keep well away from these - DO NOT TOUCH!!!) If in any doubt, consult an experienced auto electrician or your Honda dealer. Tools required: Plastic car trim tool kit (optional but highly recommended to avoid damaging trim), Philips head screw driver, flat blade screwdriver, painters masking tape (low tack), a small tray to hold screws. 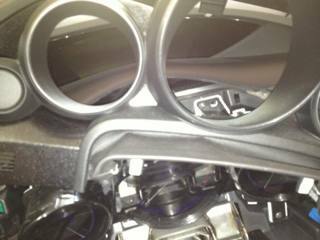 1) Just above the headlight adjuster and VSA switch panel there is an irregularly shaped trim piece (held in by clips). Look for a small slot and using a flat blade screwdriver (wrap some electrical tape around tip first) carefully lever the trim out. 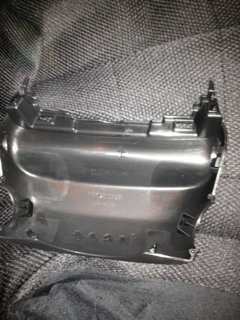 2) Remove the dash under tray (held in by clips). Do not pull too hard downwards. Unplug the wiring connectors (VSA / headlight adjust / front parking sensor switch off - where applicable). 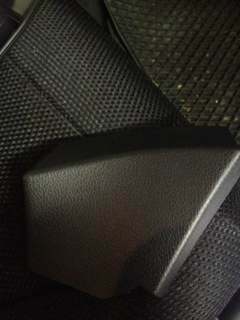 3) Pop out the steering wheel top cover/shroud (clipped in). Once removed you can pop out the two clips which hold the "vinyl cover" to the shroud. The vinyl cover is permanently attached to the cluster hood. 4) Remove the screw holding one edge of cluster hood. (Note: it's the normal screw, not the one with the washer). 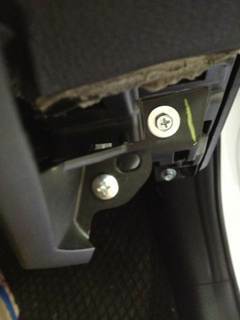 5) Remove the screw holding the long centre console trim piece. Pull the whole trim piece upwards in one motion. It is held together tightly by clips. Take your time. 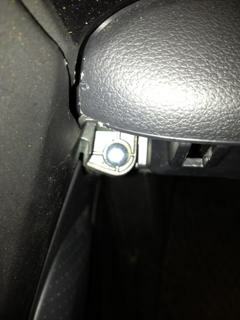 6) Remove the other screw holding the cluster hood in place. 7) Pop the cluster hood off carefully (held in by clips). Note the position of the rotary instrument dial brightness stalk. You do not want to accidentally break this. You will need to disconnect the wiring plug for the Econ mode and engine start button (if equipped). 8) Wrap some masking tape around / over the gear lever top for protection. Stick some tape on the section just in front of the Airconditioning control panel and some over the gear lever base bezel. 9) The Airconditioning panel pulls away (towards you) in one piece. It is clipped in. Unplug wiring harness(es) for auto stop/seat heaters/dual zone airconditioning if applicable. 10) Behind where the Airconditioning panel was, you will see the metal radio brackets. 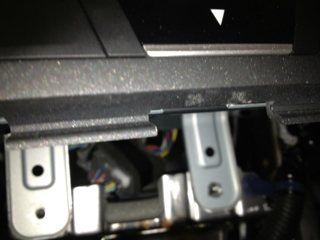 Undo the 2 screws which hold the radio in place. 11) Pull out the radio unit towards you. It is held in by clips. You can start from the right hand side and then work your way towards the left. Disconnect the wiring plug for the hazard lights first. Then disconnect the wiring plugs for the audio system. 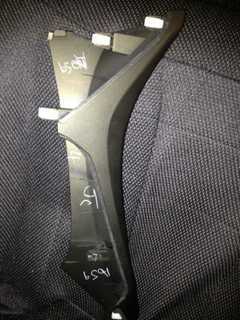 12) Reassembly is the exact reverse of the above steps. Important reminder: When re-installing the cluster hood, ensure that the rotary instrument dial brightness stalk is poking out of its hole otherwise you will snap it in half!! 13) After it is all done and back together again, start the car up and ensure all lights, systems, indicators etc appear to be working on the dash. Go for a test drive to confirm. Last edited by Vti07; 19th March 2013 at 10:38. Can I just recommend to always use plastic tools made for this very reason. Will leave no scratches and a bit gentler when bending stuff. Yes, a plastic trim tool is very handy. I bought a 10 piece kit from a UK Ebay seller and use it all the time. Last edited by Vti07; 19th March 2013 at 09:56. This is great information and should be stickied imo. Thanks Gloom. Happy to help. I'm very impressed but not something I would ever have the confidence, let alone the need, to attempt. You surely must have a fine ear for music to want to do this. I have always found the systems provided perfectly adequate. Pardon! What did you say? I am very fond of music and besides my home and job, the car is where I spend a lot of the time. Unfortunately I'm not allowed to listen at work (tram driver). Stock system is one of the better ones (one with tweeters) so I totally understand you. I need more detail and "depth" though. As I missed the nice OEM 10 speaker sound system in my previous Accord, I decided to install a 12" active subwoofer in the boot. The base 4 speaker system (no tweeter) clearly lacks low end punch. I needed to get access to the speaker signal cables somehow (preferred not to pull apart the doors though). It sounds much better than before and I do not mind the reduced boot space. Great How-To. And we thought getting to the radio in the 8G was bad!! Re: How to remove the radio? 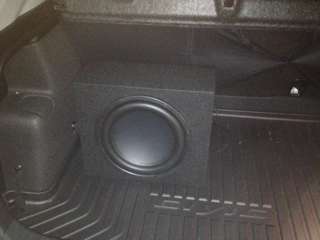 I have a 12" slim sub from my previous car but need all boot space available. Not really sure I can use it tbh but the speakers are rated down to 35hz, coupled with rears should be ok.
Gloom you will put 2-din stereo? 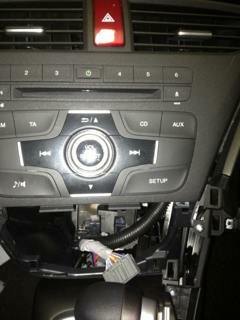 No oem radio with audison bit ten processor and mds amp. Last edited by gloom; 19th March 2013 at 15:16. Just wanted to ask you question about the process of removing radio. I apologize for repeating the question but I would love to some more information! The steps are basically from a Honda guide for installing an accessory OEM bluetooth kit however i have omitted the unnecessary steps. 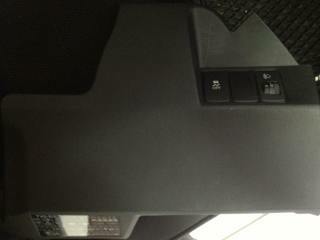 If the trim pieces are not removed (with the hidden screws), you won't be able to remove the AC/ climate control panel. Behind the panel are the two bolts that hold the factory stereo in place. You've convinced me I little bit afraid to damage any details when removing dash above steering wheel. I'm wrong? 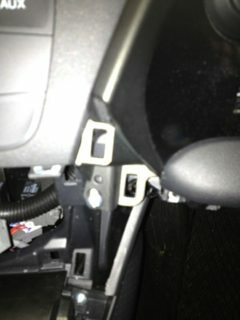 And BTW, where I can find a Honda guide for installing an accessory OEM kit, if it exist at all? And one more time, thank you. You don't have to remove the dash above the steering wheel. I did remove the radio without removing this part.